Haiko Cornelissen‘s lush, living PicNYC Table is a brilliant plant-growing furnishing that brings a taste of the outdoors to every meal. 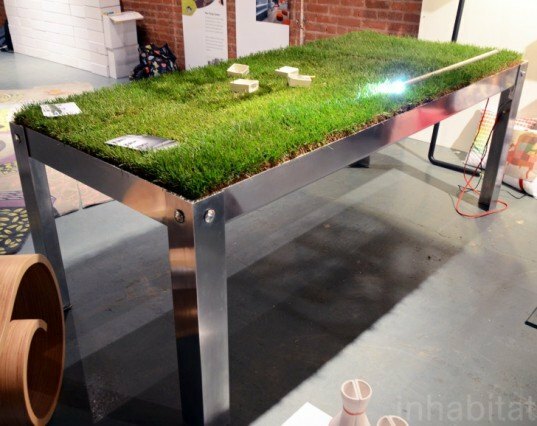 The aluminum table is deep enough to double as a planter bed, and it can grow everything from grass to herbs and flowers. We caught up with Haiko at this year’s Wanted Design exhibition during NY Design Week to ask him about his inspiration and snap some firsthand photo. Getting some greenery, even with something as simple as a grassy table, can work wonders for picking up mood and feeling refreshed. Even having an indoor plant on your desk has been shown to improve productivity. Bon Appetit!